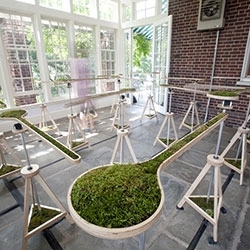 Landscape Abbreviated by Nova Jiang is a kinetic maze consisting of modular elements with rotating planters, which form a garden that is simultaneously a machine. "I am interested in the way that simple interventions can make the experience of space dynamic and unpredictable. The planters are controlled by a software program that continuously generates new maze patterns based on mathematical rules; they rotate to form shifting pathways that encourage visitors to change direction and viewpoints as they move through the space. I envision this sculpture not as a classical labyrinth built to ensnare, but rather as an architectural abbreviation of grand ideas. In this way, the maze relates to literature, mathematical beauty, game play and the rigor of software programming, as much as it does to architecture and landscape. The planters contain live moss collected from the sides of buildings, cracks in the pavement, subway grates and other urban nooks and crannies in New York City’s landscape. Full of particles of broken glass, plastic and other detritus, they form a patchwork of unintentional archaeology." Read more about the project here.